When I was 13 years old, I watched Do the Right Thing. I was a white kid in a Toronto suburb, and I was energized, angered and curious when Spike Lee's character tossed that garbage can through that window at Sal's Pizzeria. I sat for hours thinking about it, and watched the movie a half dozen times, often rewinding that scene several times to try and figure out the emotion, the purpose of that broken window. Public Enemy became my conduit between a 13-year-old white kid and the meaning behind those shards of glass. "Fight the Power" was the first piece of political music I absorbed as a youngster. It provided the context I was seeking. The buildup and frustration of that Brooklyn neighbourhood reached a crescendo and Mookie punctuated the rage of the people, providing a tipping point for the film and my inaugural lesson in race relations. As I got older, some schoolmates would label me a "wigger," a byproduct of wearing Travel Fox and dragging my radio around blasting golden era hip hop at high volume. I can see why some saw my actions as a youngster an example of cultural appropriation. I sort of acted like hip-hop was my culture, too, but as I matured I realized I was a just a guest in hip-hop, one who should not put his feet up on the furniture while visiting. Nevertheless, the gravitation towards black music, art, and culture came quite naturally. Appropriation turned into admiration, and I didn't apologize for embracing any of it. I'm 40 years old now. I have two children and write about politics and social issues. 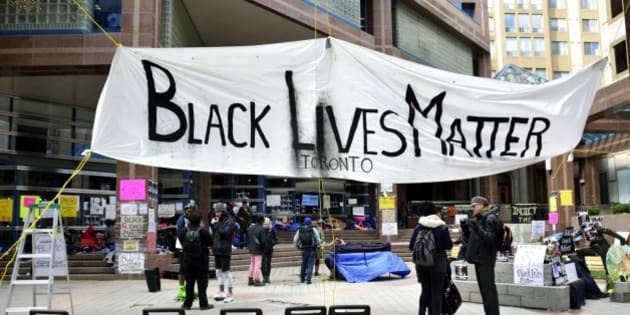 Recently, I wrote a blog calling for the resignation of the co-founder of Black Lives Matter Toronto, Yusra Khogali, citing her pattern of vitriol as an obstacle to BLM's stated goals. I knew the piece would be a little controversial, but I did not predict such a firestorm of hate, punctuated by thousands of people labelling me a white supremacist or a racist. And then that childhood hero, Chuck D, tweeted the following, and my heart sank. The kid wearing that Fear of a Black Planet T-shirt is long gone, morphed into a 40-year-old getting slammed on Twitter from the artist depicted on that shirt. Chuck D called me out in front of 580,000 followers, a stinging rebuke and a bookend to what was three decades of unquestioned admiration. But to be honest, I understood Chuck D's point. He lives in a country where the government has altered the destiny of black people, rerouting their fate through heinous and evil chapters like slavery, Jim Crowe, mass incarceration, police brutality and countless other state sponsored atrocities. I took a step back and tried adjusting my lens and realized something: the juxtaposition of a white person pontificating about the credibility and good standing of a black activist leader seems so stark to some people, good people, that even if they agreed with the underlying point they could not bring themselves to support it. And I get that. It is an honest, human response to an issue that embodies so many powerful emotions and opinions, and while I do not regret what I said, I am fine with being criticized for saying it in the first place. I still feel she is a liability, and counterintuitive towards the ultimate goal of BLM if that goal is racial equality. But does a rebuke from a childhood hero and countless others mean I want to absolve Yusra Khogali for calling white people a genetic defect? No. I would be lying if I said her comments met the threshold of rationalism. I believe that power is responsible for the crimes of humanity, not genetics. And while other writers have backed up her hyperbole, especially her statements about Justin Trudeau, I still feel she is a liability, and counterintuitive towards the ultimate goal of BLM if that goal is racial equality. A counterargument claims that because Trudeau is the head of a state with a history of oppression, he automatically becomes the leader of a white supremacist state. This ever-widening definition of white supremacy would entrap any newly elected prime minister, and incidentally also implies that Barack Obama was a de facto white supremacist himself, which, despite some questionable policies, seems like an obvious overreach and a departure from reality. Other BLM allies, black and white, constantly use words like "white tears," "whitesplaining," "white fragility," "white guilt," "concern trolling," "tone policing" and a slew of other buzzwords meant to box in critics, a tactic by the regressive left when condescension replaces civil discussion. I read so many phrases relating to my skin tone that I found myself wondering why any moderate Caucasian would ever want to align themselves with the supposed gatekeepers of racial justice. They seem to be looking for outright obedience and submissiveness, not to mention a requirement to suspend independent thought. Of course, all of their lecturing was shrouded inside a cloak of infallibility, presenting themselves as truth-tellers who were merely trying to educate someone they perceived as being uninformed. This fundamentalist approach snuffs out any chance to build bridges or enhance dialogue. In fact, it has the opposite effect. Criticizing the fundamentalism of the left can result in support from unwanted places, such as white nationalists and fundamentalist right-wingers who are pleased to see anything negative written about BLM. Interestingly, some right-wingers labeled me a "cuck" because I balanced my critique with an unabashed support for racial justice. Of course, activists conveniently referred to this as "concern trolling," a popular, arbitrary label for those who do not follow a hardline, unwavering position. I had white people lecturing me, black people praising me, and vice versa. But the eclectic set of responses from readers revealed an interesting sociological split between activists and regular people. I had white people lecturing me, black people praising me, and vice versa. The reactions proved that ethnicities are not monolithic, despite their statements that implied they were speaking on behalf of their respective races and movements. A common skin tone doesn't mean we share the same opinions, and even after receiving a death wish and hundreds of messages soaked in angry criticism, I was pleased overall to see a myriad of positions from people of various backgrounds. I was also satisfied that the fringe on both the right and the left hated my stance, verifying my status as a non-ideological thinker in the blood sport of identity politics. Granted, I'm both outspoken and stubborn, but I do not subscribe to the widely held belief that being white precludes me from contributing to the marketplace of ideas. The climate within identity politics is heavily reliant on groupthink, otherwise you are met with rebuttals like "you just don't get it," implying a monopoly on orthodoxy embedded inside racial activism. Are white people supposed to ignore black people who agree with them, and gravitate solely towards black people and their white allies with whom they vehemently disagree? Is the lecturing class the most righteous sect of activist communities? Because as someone who is familiar with the inner workings of politics and public relations, I know bad optics when I see it. The BLM leader had become a detriment to her own movement by using speech that would prevent her from sitting face-to-face with the very people she needed to engage with in order to facilitate the change she sought. A substantial amount of people believe that criticizing a black leader automatically makes a white person "problematic" or a racist. This is not a sustainable position. I approach racial issues from a starting point that makes some people uncomfortable, but self-respect prevents me from submitting to a doctrine that mimics the dehumanization that propelled systemic racism in the first place. For better or worse, I'd rather be perceived as an imperfect supporter in the realm of racial justice than a submissive pretender looking for validation.